CamRob telling RealCam about the camping trip with Paul. RealCam threatening to kill CamRob if he does something to Paul. Katya telling Toadie that CamRob is going to kill Paul and for him to believe what she is saying. Katya is trying to tell Gail, Izzy, Elle and Toadie that CamRob is the guilty one. Izzy wonders if she is looking for a scapegoat but Katya replies that CamRob saw the look she gave when she realised who he really was and thinks that he is scared. Gail asks for time to think but Katya says that there is not time to waste and she goes to call Paul. CamRob stops the car for Paul to relive himself but just as he is getting out of the car, his mobile rings and he asks his son to answer it. CamRob sees that it is Elle who is calling and answers the phone but back in No. 22 it is Katya who's on the other end of the phone but she can't talk so Gail takes the phone. She feigns what she really wants to say because Paul is somewhat busy but finally she asks to speak Paul. CamRob then does what we all do when we want to get rid of someone on the other end of a mobile phone – says the signal is starting to break up and he then closes the phone. 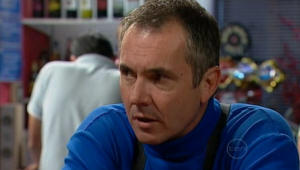 Ned tells Karl that Justine has not only lined them up another gig but has even written a new song. Karl wants a quiet word with him, so drags him through to the kitchen and isn't thrilled to hear that Justine has now joined Oodles and Noodles. They head back into the livingroom and Justine gives it to him bluntly – he's no longer playing the guitar or doing vocals…he is going to be the mascot! Gail is now starting to have worries, recalling what RealCam said when she visited. Elle and Toadie still don't think anything is up and Katya urges Gail to go with her instincts. Gail is about to head out to look for them but Elle throws her opinion into the ring – what if Gail going after them spoils the father/son bonding session? Karl is letting off steam about Oodles and Noodles to Susan and she wonders why he let Justine join the group anyway. He replies back (while making eyes at Susan) that he was a little pre-occupied at the time to object. Zeke gives them ‘a look' from the kitchen as Susan gives Karl a suggestion on how to handle the situation. They look like they want to kiss each other but again Zeke gives them ‘a look' from the kitchen so Karl heads off with Susan showing him out the door. ZEKE: Why are you and Karl acting so weird? Susan tries to act all innocent and to her relief Harold arrives wanting a chat, which she is only too glad to have to get Zeke off the scent. 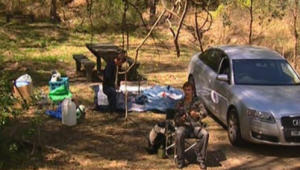 CamRob gets his fishing rod set up and goes to offer Paul a drink from his army style water bottle. Paul notices that the liquid tastes funny and CamRob apologises saying that it's been in storage and he didn't wash it out properly after it was used but Paul continues to drink while swatting the mossies that land on him. Paul then remarks that CamRob has truly come prepared after he rubs some insect repellent on his dad's neck while he continues to drink the liquid from the bottle even if it doesn't taste nice. Harold tells Susan about how he reacted when Sky told him she was pregnant and adds that he is now unsure about what he told her and is now wondering if the advice was right for her. Susan tells him that Sky will have made the decision that is right for her before adding that he's to think of the positives too especially after what the pair of them have been through – that he's going to be a great-grandfather! Harold replies that he hadn't even considered that. As Zeke listens from behind the door leading to the bedrooms, she tells Harold that Dylan won't be able to resist getting involved. He thinks that is too much of a romantic notion but Susan says that when two people are destined to be together true love always finds a way back. Karl is still moaning about them not doing his songs, so Justine gives in and says he can do his songs before handing Karl and Ned the address where they have to go to for their gig. 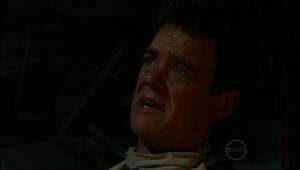 Janelle, as she is putting some rubbish in the wheelie bin, notices Toadie leaving from No. 22 and calls to thank him for the party for Boyd & Janae. She also tells him that his house is all tidy and she is starting to lay the compliments on thick but Toadie has seen through it (Janelle wanting legal advice) and decides he's got somewhere else to go, leaving Janelle frustrated at her plan not working. CAMROB: (finishing putting up the tent) I really appreciate the time you've been spending with me dad. To me it shows a real breakthrough in our relationship. (The camera then pans out and we find that Paul is lying on the ground unconscious.) Things are going to get a lot more honest between us from now on and to mark the occasion I've prepared a little surprise for you. (Dangles the car keys in front of Paul's face) Ready to take a trip down memory lane? Izzy, Gail and Elle arrive at what is supposed to be the camp site (the keeper told them where to go when the arrived) but there is no sign of the men and Izzy wonders if CamRob lied to them about where they were really going, to put them off the scent. Gail replies that CamRob isn't expecting any visitors and also that they'd panic about them not turning up which could have resulted in the police being phoned. Elle tells her mum that she's got things worked out but Gail replies that she's just trying to rationalise how CamRob would think. While she unfolds a map of the area wondering where they are, she reminds them that the keeper saw their car arrive but they aren't in the official camping area and Elle adds that she can't raise Paul on his mobile either. Gail and Elle wonder where they can start looking before it gets dark and Izzy suggests they go home and call Paul on his mobile from there. GAIL: I'm not leaving ‘til we find them. Elle replies for herself and Izzy by saying they are staying to help and head off to find them before it gets dark. Paul comes to and CamRob tells him “welcome to the land of the damned” and wonders if Paul likes the décor! Paul doesn't say anything as CamRob makes it clear that there is no escape. Paul finally speaks by asking his son why they are here. CAMROB: Oh come on dad think about it. I've been waiting my entire life for this and you still don't get it do you? CAMROB: How many more people do I have to eliminate? CAMROB: Oh careful. Yeah I've been very careful, so careful you're still convinced the plague on the family's Cam. PAUL: What the hell's going on here Robert? CAMROB: Do you really think Cam could show that much initiative? He then goes and puts a gag round his dad's mouth and ties him up before saying that Cam is an idiot and tells Paul to listen up to what he is about to say as he throws things out of a shoebox onto the floor. CAMROB: We're going to go right back to the very beginning dad, where it all started. We've got a lot to talk about. As they take their drinks back to a table, Justine moans to Ned about Karl not turning up to the gig just as Karl half dressed in the kangaroo costume comes in demanding to know where they were. Karl accuses Justine of not giving him the right address deliberately because it turns out Karl went to 55 Edmond Street while they went to 155 Edmond Street and. She in turn accuses him of not being able to read properly and that he should have called. Karl replies that he was in costume and so couldn't call before telling them about what happened at the house he did turn up to – it was full of old CWA ladies, a women shrieked, someone started hitting him and then the police arrived! Justine asks if he got arrested and Karl explains he managed to talk it over with the police and enquires if they gave the money back to the original booking. Ned tells him that they didn't cancel the booking, just improvised with the two of them by doing Justine's songs instead of his and that the host described it as the best gig they'd see. Karl is looking at them very suspiciously. The camera then pans to Harold coming in and heading to where Janelle is sitting and telling her that the two of them will be spending more time in each other's company from now on. Janelle wonders what on earth he is going on about and just as he is about to say about Sky being pregnant, he twigs that she doesn't know anything about it and stops. She tells him to say what he was about to say and all Harold can say is his famous “ah”. CamRob reads from a report card which says that he could be done with “more help and encouragement at home in order to develop his confidence at school.” He tells his dad that the teachers tried to warn him but Paul didn't listen and instead mentored ‘trash' like Dylan leaving his own son to struggle through. CamRob then shows Paul letters that he sent to him but were ‘return to sender, not known at this address' and after taking off the gag, asks if it was too hard to answer just one of them? Paul explains to his son that he couldn't because his business meant that he was never in one place long enough to get any mail. CamRob thinks this is a sign that Paul didn't care but he forcibly replies back that he did care and finally tells his son the real reason – that he was in prison and didn't want them to know. CAMROB: Are you stupid? Mmm? Of course we knew, or at least we guessed. Jail is what happens to men who agree…so's the odd air disaster. Did you like the one I set up for you? Paul looks stunned at what his son has just admitted to. We go to the bar where Janelle is also stunned at the news Harold has told her, wishing her son had been the one to tell her. Harold tells her to look at the blessings that will come out of it. JANELLE: Oh slow down. I've just gotten used to the idea of my daughter being married and now my son's going to be a father. Over at the other table, Ned is telling Karl about Katya's suspicion that RealCam has been framed by his brother and agrees with Ned that Katya needs help and can recommend someone. Ned thinks that it would be better coming from Karl and agrees to it before asking when the next Oodles and Noodles rehearsal is. “We'll call you,” replies Justine before they head out the door and conveniently entering is Katya. Karl quickly heads over to her and subtly asks how things are going. She replies confused and wonders if she can trust her own judgement anymore. Karl informs her that is normal after a damaging relationship and Katya is relieved to find to that she isn't going crazy. He then subtly suggests talking to a counsellor and that he can even arrange it for her! KATYA: If I'm wrong about Robert then I'll take you up on that. The ladies arrive at the camp site but there is no sign of the men. Elle isn't too concerned as she thinks they are just off nearby doing something and Izzy is about to agree with her until she finds Paul's mobile lying broken on the ground. 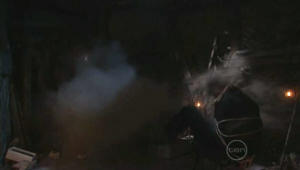 Elle discovers the empty water bottle on the ground and Gail immediately starts calling out for Paul, with Izzy following a few seconds later. CamRob seems to gloat at all the things his dad went through before he appeared as Cameron and explains why he turned up as his brother – because he got treated differently since everyone likes Cameron. He then goes on to explain about getting rid of the people who were dear to his dad and is annoyed that his plans for RealCam didn't work. PAUL: You would murder your own sister to get back at me? He justifies it as Elle was never nice to him, so Paul wants to know how he managed to fool everyone. CAMROB: Finally I've got some recognition for what I've done, what I've achieved. Go on dad admit it, you're impressed. CAMROB: (taunting his dad) Unless what? Huh? Or what? Last commercial break over and CamRob is showing Paul a painting he did when he was 6 of them as a happy family but then quickly scrunches it up says “dream on”. Next up is a fathers day gift he bought for his dad (a mug saying ‘worlds greatest dad') and says that is what he thought Paul was once but Paul didn't turn up. The mug gets dropped to the floor and smashes. PAUL: I can't have been totally useless, two of my children turned out fine. Cameron is a kid that any parent would be proud to have. CAMROB: It's easy to be good when you're everyone's favourite. PAUL: If he is favourite maybe… maybe it's because he doesn't have a chip on his shoulder. CAMROB: If I had a chip it's the end result of years of abuse and neglect nothing more. Paul tells him that is rubbish and that he was always his mum's favourite. He replies that Gail made a smart move in letting him go and wonders what she saw in him in. CamRob tells him that that he isn't going to be around anymore to ruin his mum's life…again. Before CamRob has enough time to pull the gag back over his dad's mouth, Paul asks if Gail would appreciate getting rid of him. “Time heals all wounds dad,” replies CamRob as he gathers the rest of his belongings. CAMROB: Bye dad. It's been a real pleasure but nothing compared to the pleasure of leaving you here. Oh, and one more thing. I've prepared a bit of a grand finale for you. Wait for it. He then leaves Paul looking absolutely petrified. 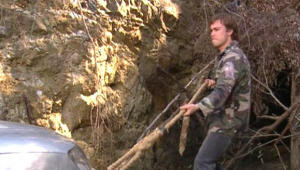 When CamRob exits the cave, he ties the rope that he used to secure the entrance to the cave with to the car. He then gets into the car and starts the engine and after shouting out “are you ready?” puts the car into reverse and quickly hits the accelerator. Once the slack in the rope is taken up, it eventually pulls the door out and so the cave starts to disintegrate.